You know those days when you just need a cup of tea and piece of gluten free cake after a blustery walk on the beach? If your beach walk is near North Berwick, then check out the new Drift cafe at Canty Bay. 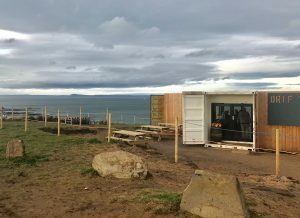 This quirky little place made from old containers, but with a cosy and stylish interior and the most jaw-dropping views, is the perfect stop-off after a dog (or not) walk along the beach. We’d been enjoying the beautiful Tyninghame / Ravensheugh Sands and decided to call by to check out the gluten free options. The kitchen is tiny and there is not yet a menu beyond scones, cake, coffee, hot chocolate and tea, but this was just what we needed! A wee bit of advanced research told me there was some good almond and cherry cake on offer and after double-checking for contamination, we were away. The cake was delicious and the cherries were plump – and the staff were super friendly and helpful! What more could I ask for? They may expand the menu in time, but if a treat and a hot drink are what you are after, then check out Drift!